PyCon 2018 in Cleveland, EuroPython 2018 CFP, zproc, catt, and much more. Python rocks. But can you ace a Python coding interview? Make sure you can. 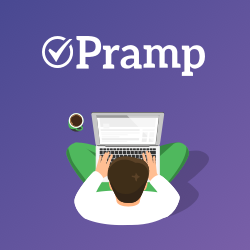 Pramp, a peer-2-peer mock interviews platform allows you to practice for free on demand. Just do what you know best - code. Once we'll also find out how good you are, we'll reach out with job offers at top companies. PyCon starts tomorrow in Cleveland. If you are going to attend have fun! Submissions will be open until Sunday, May 20, so submit your proposal soon! An JSON+HTTP server for the rope Python refactoring library. Python3 library for playing with words. Automated Security Testing For REST API's. Reference implementations of MLPerf benchmarks. Using Python code with a Raspberry-Pi, PIR motion and a Picamera, you can create a device which will email you a snapshot image when someone enters your room. Python library for requesting root privileges. Don't want to spoil it, but it has something to do with your editor/ide. Read the article! Nice bokeh tutorial here. Get started with these simple visualizations. The benchmark you were looking for. Masking images in your PyQT5 app. A look at a few different tools for extracting data like text and images from PDF documents. A little guide on how to improve hyperparameter tuning. Learn about DBus and how to use this high level inter process communication protocol in your Python app.